The Forum for Social Protection, which was held under the patronage of the Minister of Social Development, Mrs. Hala Latouf, recommended the need to develop appropriate social protection systems and an efficient social safety net that enhancing human capital and productivity, reducing disparities, enhancing prosperity and response to shocks. The Forum which was organized in cooperation with the Friedrich Ebert Foundation, recommended with the participants of many local and international experts and civil society organizations of the need to create a coordination between the service providers, whether governmental or civil society organizations, and the voluntary sector, because coordination ensures greater efficiency in delivering services to those who need it. The Forum also called for dealing with the system of social protection from the care approach to the human rights approach and the need to change in the way of dealing with them. The first session of the forum was entitled “Recent trends in the global social protection forms and ways of financing” Ahmed Awad, Director of the Phenix Center for Studies, Ms. Ursula Kulke, Social Protection Coordinator for worker activities in International Labor Organization in addition to Dr. Zaid Hamza, Former Minister of Health. The second session of the forum dealt with the roles of official institutions and civil society organizations in promoting social protection especially for marginalized groups and the challenges facing the protection system, in which Dr. Ghadir Al-Hares, Assistant Secretary General of the Higher Council of Affairs of Persons with Disabilities, and Mr. Musa Sabihi, Social Security Corporation Media Director, and Mr. Samer Balqar, Director of Tkiyet Um Ali. The forum’s third session was dedicated to discussing the proposed scenarios to strengthening the social protection system in Jordan. 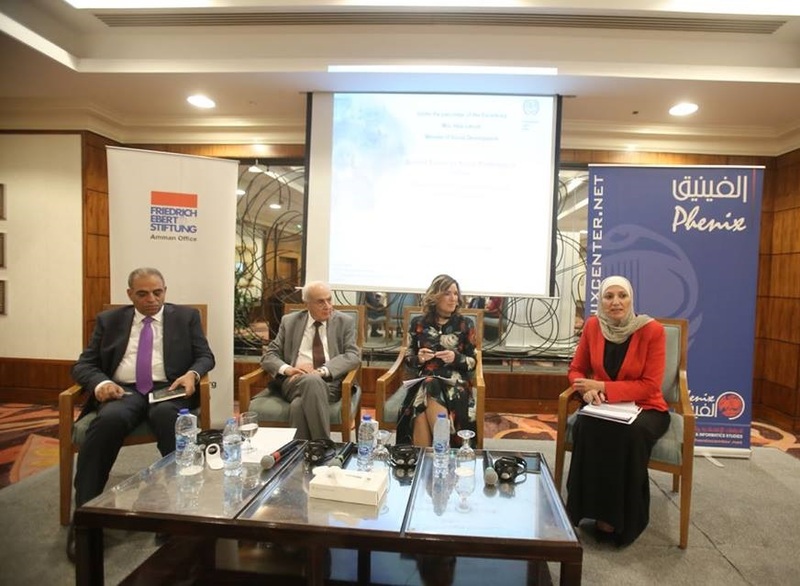 The session was benefited from the contributions of Dr. Musa Shteiwi, Director of the Center for Strategic Studies, Dr. Krzysztof Hagemejer, International Expert on Social Policy and Social Protection Studies, and Dr. Fawaz Ratrout, Spokesperson for the Ministry of Social Development.